(P1) President Obama and I agree: Equality for women should mean equal SUBJECTION to DRAFT REGISTRATION. (P2) Will America’s military be FUNDAMENTALLY transformed? Maybe. (P3) I’m against a draft in general, despite ONGOING efforts by people like Congressman Charles Rangel to bring it back. But if we’re going to have a draft, I don’t see why it shouldn’t apply to women, too. And I’m happy to see that President Obama agrees with me. (P4) In the old days, a nation could lose a large CHUNK of its FIGHTING-AGE men and still BOUNCE BACK, so long as its FERTILE women remained. (P5) But nowadays, women’s primary activity is no longer childbearing, and many women will never have kids at all. And even those who do have kids often delay childbearing until their late 20s or even 30s, long after any draft-induced military service would end. (P6) There’s also the question of fairness. In the past, it maybe made sense to require men to PUT THEIR LIVES ON THE LINE for their nation. But we have equality, now. Women vote, are overrepresented among college graduates, live longer than men, and so on. (P7) Meanwhile, to be CONSCRIPTED into the military is to be ripped from your home, friends and family, to see your life plans PUT ON HOLD, and to be subjected to a kind of harsh DISCIPLINE that civilians never encounter — while being placed at the risk of death. If men, who have historically been subjected to this, are to remain subject to it in the future, then why shouldn’t women? (P8) In today’s modern society, I see no reason why men should be subjected to the draft, or to its PRECURSOR, registration, while women are not. (P10) I agree. Women should be just as subject to draft registration as men. That’s what equality means. In Israel, there is MANDATORY military service for both men and women; in South Korea, only for men. Which system do you think is better? 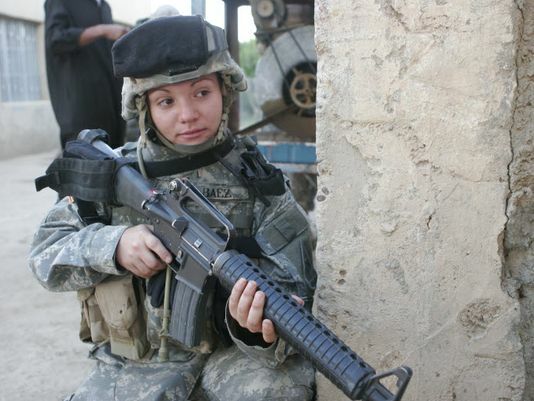 Do you think that women in the military should serve in COMBAT, or not? Has anyone in your family served in the military? Is the idea of equality between men and women completely accepted in your country?